With new build construction and renovation projects, the likelihood of needing to cut or core a concrete slab is high. There is inherent risk of striking rebar, electrical and communications conduits, and post tension cables during cutting, coring or drilling process. The cost of such mistakes can be prohibitive. Unreasonable constraints on already thin budgets can occur, as well as infusing havoc into your schedule and creating a safety hazard for your employees. 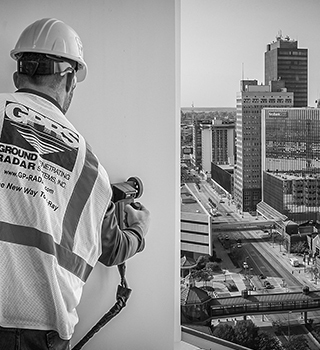 Our well-trained, skilled, experienced project managers respond quickly to service requests, especially when your need for concrete scanning is a last-minute discovery. The end result is professional, accurate and timely scanning - the exact satisfaction you're seeking to mitigate risk and keep your employees safe. GPRS-trained project managers are able to locate rebar and post-tension cables within the concrete using GPR technology. Reinforcing steel locations are marked directly on the work surface to ensure safe and efficient drilling that will preserve the integrity of the structure and reduce the need for repairs or patching. This helps our clients conduct core drilling without accidents, injuries or delay. 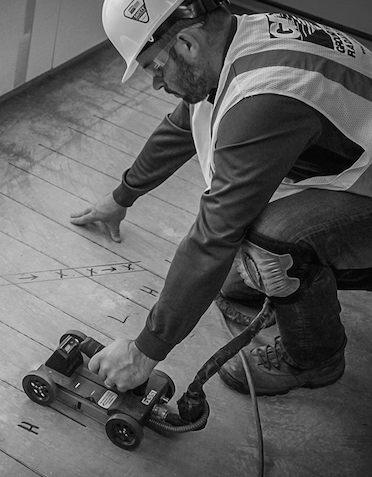 GPR scanning is also useful when preparing for a renovation that includes electrical outfitting, plumbing, fire protection services, drain installation and duct work. Also crucial in the scanning process is determining what’s in the concrete structure. This includes gauging the concrete thickness, what the rebar content is, its spacing and its elevation (depth) in the slab. This extensive, critical information helps our clients’ engineers understand the makeup of the concrete. 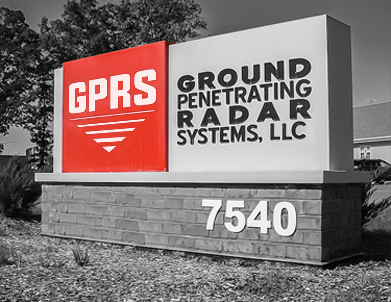 Through their extensive training and experience, GPRS project managers have the ability to locate voids - air gaps between the sub-grade, dirt and the concrete slab-on- grade - hidden below concrete or asphalt surfaces. This degradation occurs over time due to compaction, pipe ruptures or erosion but is often undetectable on the surface. 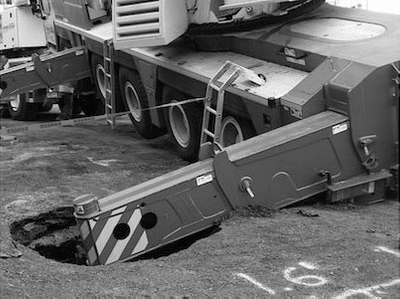 GPRS ground penetrating radar technology can help our clients locate these areas and – most important - avoid collapses. Priority No. 1 in concrete scanning is protecting the structural integrity or strength of the concrete, making sure the integrity of the structure is safe. 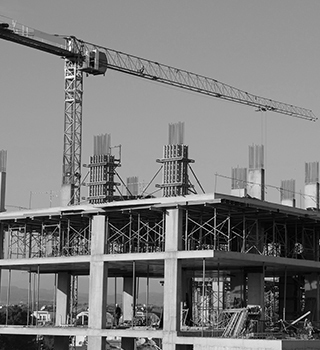 When we detect and mark sections of reinforcing steel embedded in the concrete, it guides concrete cutters and drillers away from the steel, helping them avoid injury and protecting the integrity of the concrete. Of particular concern – and danger - are post-tension cables. 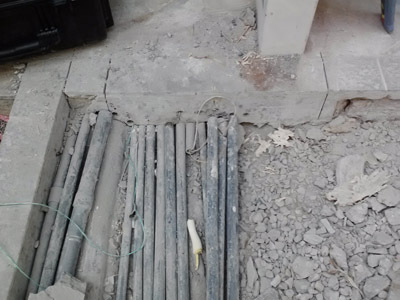 The high tension these cables are placed under is great enough that if a post tension cable is accidentally cut, it’s possible the cable could break through the concrete and injure a worker as well as damage the integrity of the structure. Another major safety reason for GPR concrete scanning is to detect electrical wires encased in conduits. Marking these conduits helps cutters and drillers avoid them, while also avoiding the life-threatening consequences of an electrical shock from striking one of them. 1. 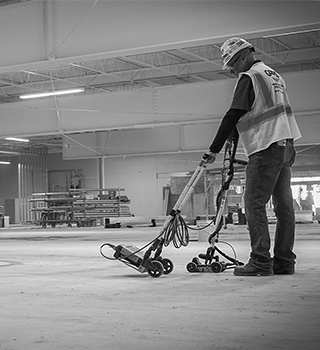 Can Ground Penetrating Radar scan concrete slab-on-grade? Yes, we can. Usually we hear this question from someone familiar with concrete x- raying. While x-raying concrete is still a valid technique for determining the location of reinforcing steel it’s limited to elevated concrete slabs because you need to have access to both sides of the concrete. One side is for the radioactive isotope, the other for the film. Ground penetrating radar is a completely different technology. GPR only needs access to one side of the concrete. This fact makes it ideal for scanning concrete slab-on-grade applications. 2. Can Ground Penetrating Radar identify the difference between rebar, post tension cables, electrical conduits and other embedded materials? 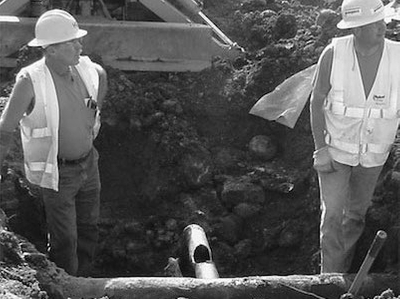 While GPR does not determine what type of object is being located, GPRS project managers are experienced at using all available data in identifying the type of reinforcing steel or electrical conduit present. The photo to the left shows a typical post tension cable mark out. Using GPR and other data, we are able to locate all of the reinforcing steel anomalies. We then mark the findings on the concrete and, based on the pattern, are quickly able to determine what each marking indicates. Most often, when something is on an angle through a square layout it will be a conduit. You will have a typical rebar pattern with 12-to-18 inch centers. Post tension cables tend to be spaced further apart, depending on the building’s design and whether they are banded or uniform tendons. 3. How Accurate is Ground Penetrating Radar with marking anomalies in concrete? We have found that our typical accuracy is +/- ¼” to the center of the object in concrete we locate: conduit, post tension cables, and rebar. 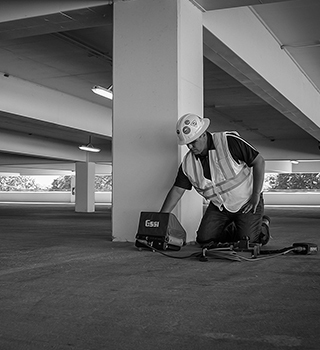 With GPR, we can also pinpoint the depth of every object we locate in concrete with an accuracy of +/- 10-15%. The photo below shows a typical elevated concrete slab layout after we finish scanning. The locations of all rebar, post tension cable and walker ducts are marked on this layout. Because GPR’s accuracy is so high we can offer our professional opinion to the contractor helping them know where they are able to drill without the risk of hitting any of the objects marked on the slab. For safety concerns, we always tell contractors to move one-two inches from any marked line as they prepare to cut or drill to be sure they safely miss any embedded object. 4. Are there any health risks associated with Ground Penetrating Radar? This concern usually comes from someone familiar with x-raying concrete since the health risk of radiation-exposure from x-rays is well known. Although x-raying remains a viable and accurate testing method for mapping objects embedded in concrete, x-ray companies must ensure safety by clearing people from a large area around their x-ray location. They must create a safe and controlled environment. In comparison, the typical power output of a GPR antenna is less than the cell phone most of us carry around. As a result, there are no health concerns with our project managers, construction workers, or tenants in the building where the work is taking place. Also, GPR is a quiet process so noise issues are not a concern. 5. How long does it take to scan an area for core drilling? Ground penetrating radar is an extremely efficient and fast technology. Large areas can be scanned quickly with ease. 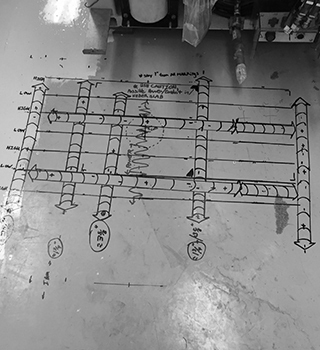 Our standard layout for a typical core drilling location is 2 by 2 feet. It usually takes about 10 minutes to scan and mark an area this size.